Track and field's super star Usain Bolt returned to the island on Monday afternoon following season ending victory at the World Athletics Final in Greece on Sunday. at the Terra Nova Hotel in Kingston at 5 o'clock. 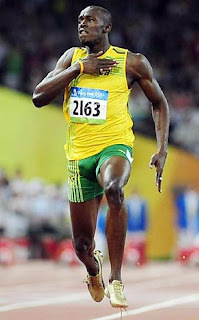 Bolt repeated his Beijing Olympics sprint double success with world record victories of 9.58 and 19.19 seconds and was also a member of the gold medal winning sprint relay team. Meanwhile, members of the MVP camp including World Champion Brigitte Foster-Hylton and Asafa Powell will return home at a later this month as they are off to Asia to compete at the Shanghai Grand Prix in China on September 20.